Your garden will be designed by an award winning Master Gardener. 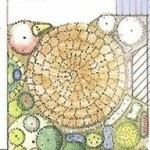 Maureen Taylor has a degree in Horticulture and Landscape Design. She is a board member of the Landscape Design Associates and an active member of Landscape Design Association and Midwest Ecological Landscapers Association. Taylor Made Landscape Design has been awarded the “Angie’s List Super Service” award for 2011, 2012, 2013, 2014 and 2015. Maureen has started several community gardens in the Old Irving Park neighborhood of Chicago where she lives. In 2007 she won the prestigious Mayor Daley’s Landscape Award for her own backyard.